GLASSBORO – Barnes & Noble was once an island on Rowan Boulevard. The bookstore — selling Rowan University textbooks and swag — was the first to go up less than a decade ago. Seven years later, the massive two-story bookstore isn’t so easy to pick out of the downtown Glassboro landscape. It blends perfectly with the half-dozen buildings that sprang up around it since it opened in 2010. 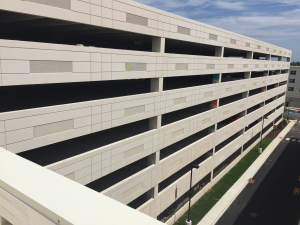 Wednesday, five more buildings opened on Rowan Boulevard, a public-private partnership between the borough and Rowan University. A 935-space parking garage on Mick Drive is the second garage to open on the strip. Four more buildings expand classroom and student housing space for the university, increasing the number of student beds by 557 in two buildings — 230 Victoria and 223 High — where students will live starting in September. 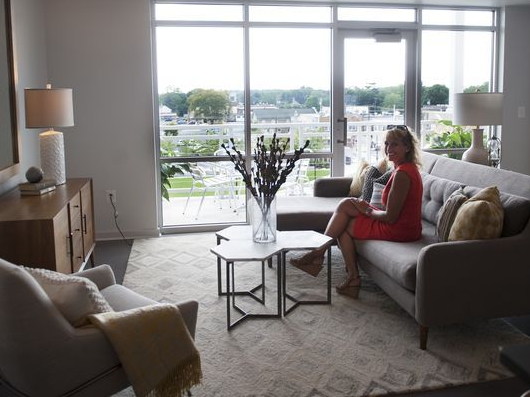 A third residential building — Park Place South — houses 37 market-rate luxury apartments overlooking the newly built Glassboro Town Square. All but eight Park Place South units are leased, according to Ronda Abbruzzese, vice president of marketing for Nexus Properties, the company constructing the buildings and managing the properties. A 30,000-square foot building — 260 Victoria — increases Rowan’s learning space with seven classrooms totaling 210 seats, plus 48 new offices for the university’s writing arts and communication students departments. “I’m thoroughly impressed every day with how quickly these buildings go up,” Abbruzzese said. The new building cluster — all a mix of residential and retail space — were completed in 16 months. 220 Rowan Boulevard, a housing and retail building opened in 2016, went up in just 14 months, according to Abbruzzese. The cluster cost $110 million, Nexus reported. “We wanted to give the community the feel of a college town,” state Sen. Stephen M. Sweeney said at a ribbon-cutting ceremony. Construction on the final phase of Rowan Boulevard went on behind the state Senate president as he spoke from the podium. The last piece of the boulevard is expected to open in July 2018. The ceremonial opening of the buildings — called the “A3″ phase of construction — is the second -to-last piece of the puzzle for the 26-acre plot Glassboro set aside to redevelop the downtown zone. More than 90 houses — including many belonging to fraternities and sororities — were razed to make room for the project. “I joined this university in 2006, and let’s just say this town was not the most impressive-looking town in the neighborhood,” Rowan University President Ali Houshmand recalled. This entry was posted in News on August 29, 2017 by Kathy Ward.